This chapter is an exploration into how breakdancing (“breaking”) can be a vehicle for understanding the inherent tensions and dualities of the night, or what I term the “nocturnal paradox”. It moves beyond hegemonic discourses and regulations of night-time culture that are increasingly focused on its economic valorization to show how breaking—an activity in Sydney (Australia) that exists outside economic transactions—can offer a means to experience and navigate the nocturnal city in new ways. At a time when the strict regulation of lockout laws has spurred a slow decline in the economic-viability of nocturnal cultural activities in Sydney, breakers utilize the empty urban landscape to freely experiment with creative expression. 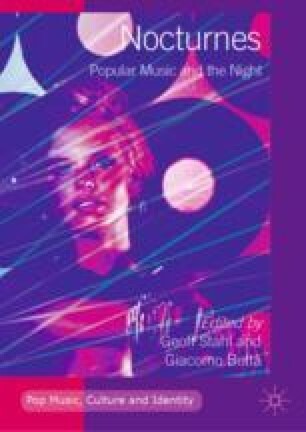 This chapter moves beyond the often-limited and paradoxical framings of night-time culture to show how breaking reveals the potentials of the night. ———. 2016. The ‘Systems of Relay’ in Doing Cultural Studies: Experimenting with the ‘Body without Organs’ in B-Girling Practice. Continuum: Journal of Media & Cultural Studies, Situating Research, Situating Practice: New Voices in Cultural Research 30 (2): 183–194. https://doi.org/10.1080/10304312.2016.1143194. Hadfield, Phil. 2015. The Night-Time City—Four Modes of Exclusion: Reflections on the Urban Studies Special Collection. Urban Studies 52 (3): 606–616. https://doi.org/10.1177/0042098014552934. Homan, Shane. 2017. ‘Lockout’ Laws or ‘Rock Out’ Laws? Governing Sydney’s Night-Time Economy and Implications for the ‘Music City’. International Journal of Cultural Policy, 1–15. https://doi.org/10.1080/10286632.2017.1317760. Hughes, Caitlin Elizabeth, and Alexander Shou Weedon-Newstead. 2017. Investigating Displacement Effects as a Result of the Sydney, NSW Alcohol Lockout Legislation. Drugs: Education, Prevention and Policy, 1–11. https://doi.org/10.1080/09687637.2017.1306023.